Fancy the sound of Cajun pudding made from turkey? Or Caribbean bacon in a bag? It may be a long way from the Caribbean to Tipperary but it’s worth the wait when it comes to Lisduff Fine Food’s imaginative, tantalisingly tasty bacon and turkey products, sold every Saturday at their Milk Market stall. 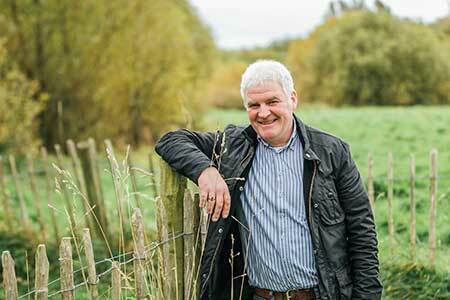 Robert Tormey started learning his butcher’s craft at the age of 12. Now, with over 40 years of experience behind him, Robert has earned a reputation – and multiple awards – for his premium hand-crafted bacon and turkey products. Robert was born and bred out of four generations of butchers, and all that heritage and history is evident in the unique, salivating taste of his bacon and turkey range. His wife, Anne, and their daughters, Jane, 26, and Kate, 20, are – in Anne’s words – the foot soldiers sent out to sell the goods at the Milk Market. Having started from scratch six years ago with a stall in the Milk Market, today Lisduff’s products are available in Supervalu and in shops throughout the country. But Anne, pictured above, insists it was the Milk Market that made them and that’s why it’s the only farmer’s market where they have a stall. “Robert was a butcher all his life and he had a butcher’s shop. One day one of the suppliers came in with this cook bag, and Robert decided to dry cure and roast bacon in the bag because that way it wouldn’t have as much salt in it. 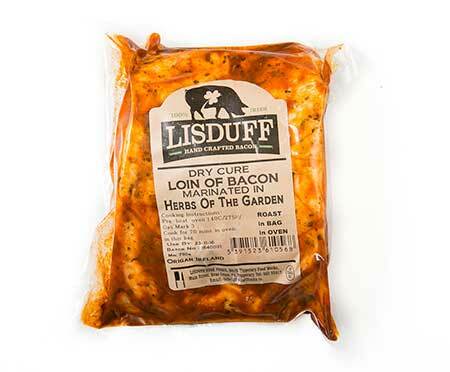 That’s really how Lisduff Fine Foods began. If he was doing it in the shop, he could only supply a limited number of people in the radius of the shop, so we heard about the Milk Market and decided to start from there. “We live on a farm in Lisduff in Laois, but we started making the bacon in a bag products from a food unit in Rearcross in Tipperary, and selling the products in the Milk Market on a Saturday. Robert was one of the first people in the country to make bacon in this way, so it took off, but in the beginning times were hard. Some days you could be going from 6am to 1am that night. We all worked hard and for very little money,” Anne recalls. 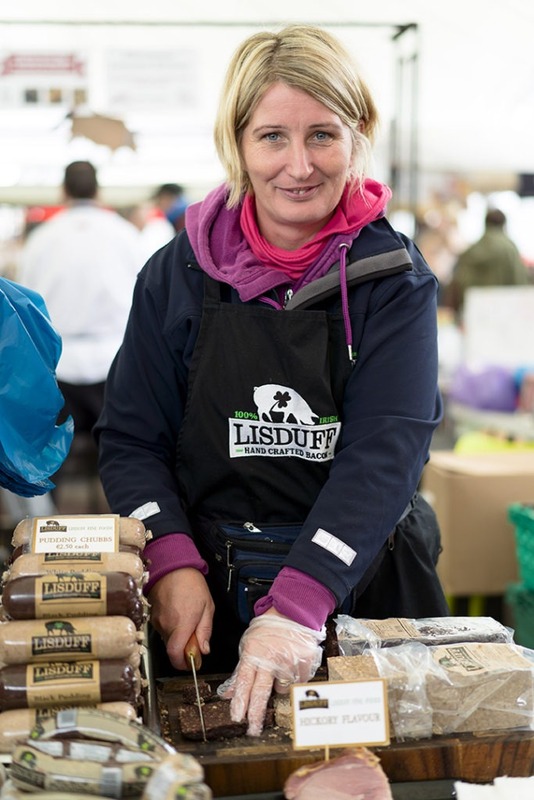 With support from the Tipperary Enterprise Board, Lisduff Fine Foods grew and they moved to a new premises in the Streame Industrial Estate in Nenagh. Robert grew up in the craft butchery business and came up with new, innovative products: turkey rashers and sausages, cajun turkey pudding, roast in the bag bacon in a selection of marinades, from Caribbean to honey and mustard, or hickory smoked. Robert developed his cook in the bag range to meet today’s busy lifestyle offering quality bacon with a modern twist. These products are sold in two sizes – small (750g) and large (1.5kg). Aware that customers were becoming increasingly health-conscious, Robert started making turkey products because they are high in protein and low in cholesterol. 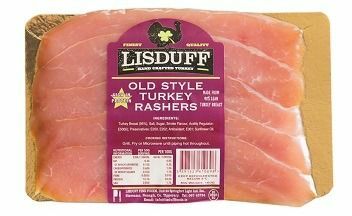 Lisduff’s turkey rashers are made from 100% turkey breast, traditionally dry cured and sliced, with an old style rub which gives a rich and lightly smoked flavour with a good balance of sweet and salty tones. 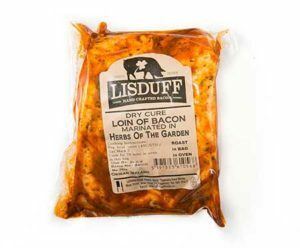 As well as the exotic Caribbean flavours and turkey products, Lisduff Foods also sells the traditional bacon rasher, each one dry-cured and hand-sliced by Robert – a thick-cut every time with no shrinkage. Robert’s streaky rashers are the ideal sandwich component for that weekend indulgence. As well as rashers and bacon joints, Lisduff has traditional black and white puddings made from an old Tormey family recipe which has been passed down through four generations developing a timeless classic pudding. Their award winning black and white puddings are sold in a variety of ranges including chubs, bites, and rings.